Amilcar Guzman is the Director of Data and Evaluation at CASA, where he leads the organization’s Evaluation Department. In this role he partners with senior leadership at CASA to establish cross-cutting evaluation priorities and examines the organization’s programs, policies and practices. Prior to joining CASA, Amilcar worked in education policy, research and analysis at numerous Washington, DC based organizations including the Data Quality Campaign, National Council for Community and Education Partnerships and the Council of the Great City Schools. 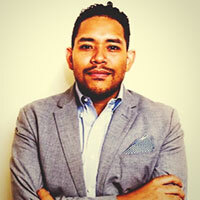 Amilcar began his career as a CHCI Public Policy Fellow. Currently, he serves as the National President of the CHCI Alumni Association, Board Member of the Congressional Hispanic Caucus Institute where he advocates for the interests of over 3,500 CHCI Alumni across the country. He is pursuing his Ph.D. in Educational Leadership and Policy (Higher Education) at the University of Maryland, College Park- where he studies the postsecondary outcomes of Latino college graduates.